Philips Respironics, one of the most trusted names in sleep therapy, has hit it out of the park with the design of their new DreamStation platform. They started with a clean slate and conducted extensive research with CPAP users to come up with a CPAP machine platform that is truly cutting edge. The DreamStation's elegant graphical interface and large color LCD screen are matched with a host of advanced comfort and compliance features including A-Flex, EZ-Start, SmartRamp, OptiStart, built-in Bluetooth, and event detection and response. 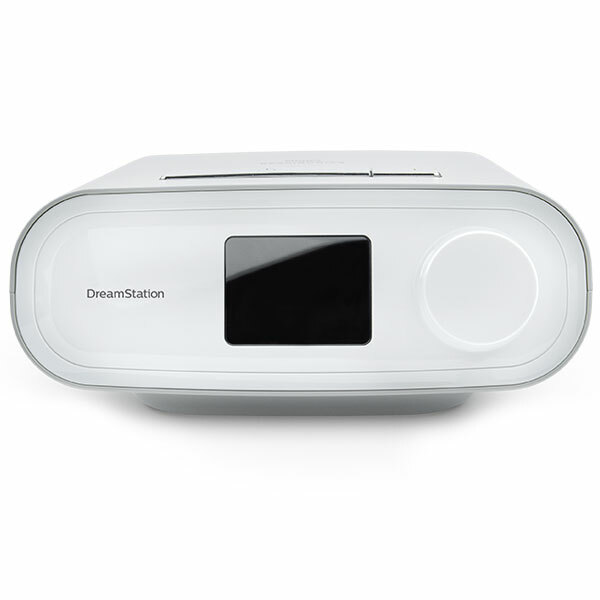 Sleek, Modern Design with attractive full color display: DreamStation's simple shape and full color display are a welcome change for sleep therapy patients used to bulkier, heavier, less attractive machine options. Small and lightweight, with a modern, non-medical design that blends in on your nightstand, the DreamStation is also very user friendly, and fits easily in the included travel bag. The vivid full color display makes it easy to scroll through machine settings with the ergonomic control dial. Opti-Start: The Opti-Start Features starts your pressure therapy at 90% of the pressure reached in the previous session to help address any events that may occur early in your sleep therapy. This feature can be enabled or disabled per the user's preference. 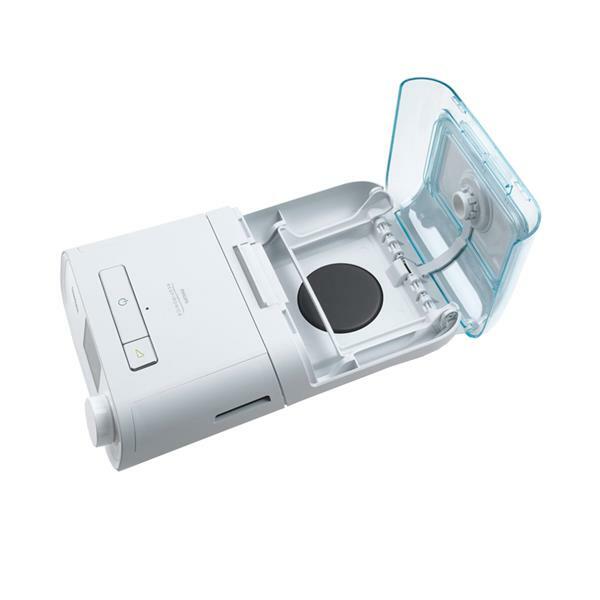 Heated Humidifier with DryBox Technology and Adaptive Mode: The DreamStation's optional integrated heated humidifier attaches directly to the CPAP unit and utilizes DryBox Technology, which helps to prevent water from exiting the humidifier and entering the machine in the event that the machine is moved or jostled with water in the chamber. Adaptive mode monitors ambient humidity and temperature in the room, and automatically adjusts heat levels during the night to provide optimum humidity . The humidifier can also be set in a standard fixed heating mode, which provides constant heat levels throughout the night if the user prefers to adjust the humidity manually to their own comfort level; both the humidifier and heated tube have heat settings of 0 to 5. Preheat will heat the humidifier up to 30 minutes before starting therapy. Mask Fit Check: This feature allows the user to check for mask leaks by applying pressure to the mask and illuminating an icon on the machine to tell them if an adequate mask seal has been achieved. SmartRamp: This is a ramp option that will allow the machine to stay at a lower pressure until events are detected. If the event requires a pressure higher than the current ramp pressure, but lower than the prescribed pressure, it will increase to that pressure and maintain that pressure until ramp time is completed, or until an event occurs requiring a higher pressure. When the ramp time has been reached the machine will increase to the prescribed pressure or to the minimum pressure range if the machine is in auto-adjusting mode. Standard Ramp operating mode is also available. 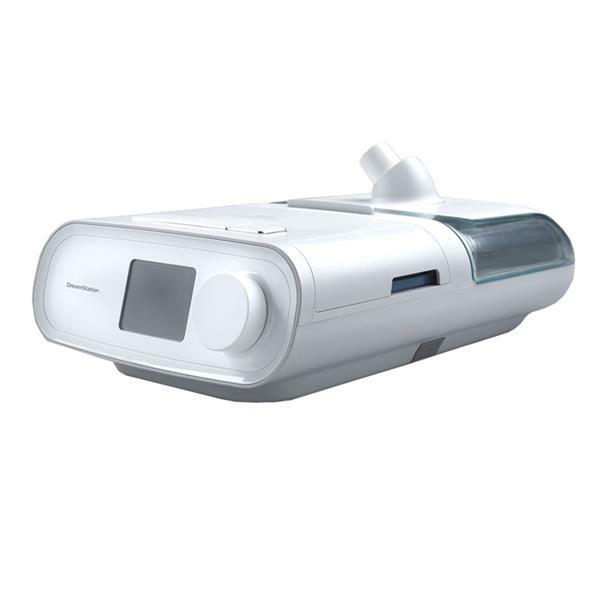 Advanced Data with BlueTooth and DreamMapper: The CPAP machine captures and displays advanced data such as AHI, Periodic Breathing, Leak Rate, 90th Percent Pressure (the pressure the machine was at or below 90% of the time), and Therapy Hours. Built-in BlueTooth connectivity allows the user to upload this data to their mobile device, where they can track this data and access motivational alerts, troubleshooting advice, and educational content via the DreamMapper App. DreamMapper is available on compatible iOS (iOS 6 or newer) and Android devices (2.2 or newer) and can be downloaded in the iTunes App Store or the Google Play Store. Advanced Auto Adjusting Algorithm: The DreamStation uses the same trustworthy auto-adjusting algorithm that was employed by the venerable System One platform. This feature monitors the user's breathing breath-by-breath for apnea events and flow limitations and adapts to them, automatically adjusting therapy throughout the night to ensure that optimum pressure is provided for effective resolution of apnea and a restful night's sleep. Dimensions: Machine only - 6.2" x 7.6" x 3.3"
Dimensions: Machine+Humidifier - 11.7" x 7.6" x 3.3"
I was under the impression my insurance covered 80% of my CPAP machine. I found out when I went to pick it up that the 80% only kicked in after I met my $1000 out of pocket. I left in a huff. They wanted to charge me over $1500 for the machine I just bought from bestcpapprice.com for less than half that. I'll recommend www.bestcpapprice.com to anybody that mentions needing a CPAP machine! Very nice machine! Very good customer service! I ordered the Respironics DreamStation. I absolutely love this machine. It is far and beyond better than my 5 year old CPAP machine. I really like the reduced pressure when I exhale as it makes for more pleasant experience. I have not used the humidifier yet, but plan to do so soon. The machine provides a nice interface to review you compliance, and other useful stats. My old CPAP was going on 10-11 years old. Was suggested to get a DreamStation Auto CPAP Machine from bestcpapprice and wished I had gotten it sooner. Gives you a lot of information and haven't had a bad night sleep since I have received it. Works great. I highly recomend it.